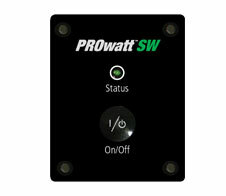 The Xantrex Prowatt SW remote provides the convenience of a simple on/off remote function to the user. It also has an automatic ignition lockout feature to shut down the inverter’s output when the vehicle’s ignition or a 12 VDC enable is not engaged. A 25’ remote cable is included with the remote panel.